Therefore, land to the north has cooler temperatures during the winter months while more southerly regions see temperatures remain constant year-round. Also, there is more variation in the north with summers being hotter and winters colder. That doesn’t mean the climate is the same in all southern or northern areas. There can be differences in temperatures, even in areas relatively close together, due to elevation. The higher the elevation, the cooler the average temperatures. The closer you are to sea level, the hotter that region is on average, and often more humid. In beach areas, high temperatures and humidity are tempered by delightful sea breezes. Overall, because of the country’s varied topography, Mexico has one of the world’s most diverse climate systems. Head south to the coastal plains and the Yucatán Peninsula, in cities like Mérida, Cancún, Playa del Carmen, and Tulúm and you will find average temperatures from around 75 F to 82 F. Temperatures stay high all year in this region and only vary by about nine degrees between the highs of summer and the lows of winter. However, there can be some very hot spells. Temperatures over 100 F in Mérida are not uncommon in the height of summer. From about May to October, expect frequent rains as part of the rainy season, although mostly you get afternoon showers. Humidity runs from about 80% to 90% generally. By contrast, Baja California Sur, on the northern Pacific coast of the country, is dry—it’s a desert climate. This means in places like La Paz, on the Gulf of Cortez, or Cabo San Lucas on the southern tip, you experience hot summers (reaching into the 90s F, cooling off to the 70 to 80s F at night) and mild winters (70s F during the day, dipping into the 50s F at night). In the Colonial Highlands region, which is roughly in the geographic center of the country, you rise in elevation to 6,000 feet and up. Here you have t-shirt weather almost all of the time, with temperatures generally in the 70s and 80s F. The hottest months are April and May, with daily highs reaching to the high 80s F. But the heat of the day always burns off at night, dipping down to the 50s F after dark. This is also known as high sierra, which means you have a generally dry climate and crisp, clean air, although there is a rainy season from June to September, with the rainiest month being July. Colonial cities popular with expats, including San Miguel de Allende, Queretaro, and Guanajuato, do have some cold periods. January is the coldest month, with temperatures approaching freezing on some nights. A similar mild, spring-like climate is shared around Lake Chapala. Centered around the lakeside towns of Chapala and Ajijic, this area has a large expat population (mostly retired Americans and Canadians), with a history stretching back many decades. One of the major reasons this became an expat destination (especially for snowbirds) is the consistently mild temperature, with highs ranging from 70s to 80s F throughout the year, and lows in the 40s and 50s F. There is also low humidity, and very little rain from November through May. But just five hours’ drive to the west, on the Pacific coast, you find the large resort town of Puerto Vallarta, as well as smaller funky beach towns like Sayulita. This coastal region is marked by a warm and humid climate, with June to November being the hottest time of year—temperatures hit the 90s F for a daytime high, while from December to April (considered the best time to be in town, weather-wise) it’s in the low 80s F.
A wide variety of climates in Mexico means there is something for everybody, whether you want a warm coastal vibe with breezes, or the crisp, dry, and not too hot, not too cold highlands areas of the interior. And any place is certainly a welcome relief from frigid winter weather in the U.S. and Canada. It’s no wonder the expat population swells at that time of year. Someone asked me recently what city in Mexico has the best climate. Questions like this are subjective, so at the time I said, “It depends.” It depends, of course, on your own tastes and temperament. If you want a year-round, spring-like climate in the 60s F to 80s F, consider Cuernavaca. Its mild climate has long made it a popular weekend getaway for busy folks from Mexico City. In fact, with so many visitors, Cuernavaca can get downright hectic. If that’s not your style, then consider the Lake Chapala area, near Guadalajara, instead, where the weather is nearly as mild and constant as Cuernavaca. Lake Chapala is home to arguably the largest—and one of the longest-established—expat communities in the world, and its climate is one of the reasons why. If you like to enjoy four seasons but don’t want extremes, then check out Mexico’s Colonial Highlands. Thanks to the high elevation, many cities here have sunny, relatively cool summers and cool off at night. Winters are chilly enough for a jacket or light coat…but temperatures seldom get down to freezing. Because the climate is a “light” version of what many people are used to in the U.S. This area is also popular with expats. You may want to check out cities in this region such as Morelia, Guanajuato, and San Miguel de Allende. If you’re among those who love the beach but can’t take humid heat, then your options in Mexico are limited: You need to check out Sonora or the Baja Peninsula. In these areas you’ll find a desert-like climate that’s generally hot and dry, cooled along the coast by sea breezes. Most people tolerate dry heat better than humid heat—and that’s why you’ll find them in places like Todos Santos or La Paz, in Baja California Sur. If you do tolerate humid heat and are looking for a beach to hang out on, you can find this climate pretty much everyplace else on Mexico’s coast. But here are two recommendations. 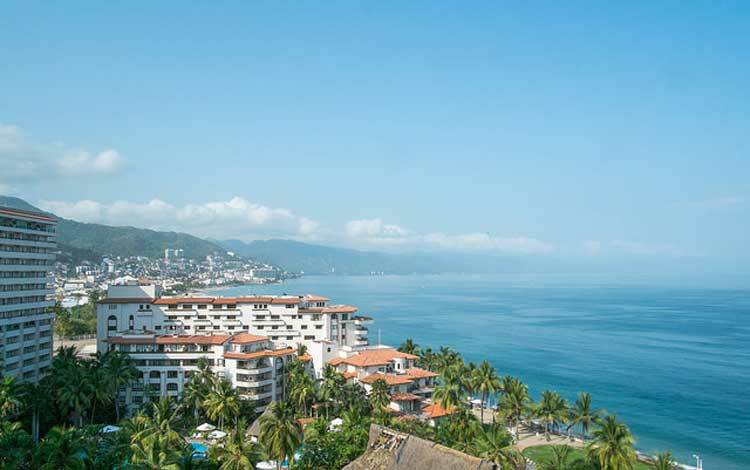 For those seeking sophistication, there’s no place like Puerto Vallarta, on the Pacific coast. It’s the ultimate international resort, with high-end restaurants, romantic hotels, and one of the most beautiful bays in the world. On the other hand, if you want to get away from it all—but with some amenities—then head to the Yucatán Gulf coast. Here, just a short drive from Mérida, you’ll find authentic fishing villages and a low-key vibe. In these destinations it’s very hot and humid in summer—but winters are glorious. But for all-around best climate in Mexico, my own personal pick is none of these. It’s Ensenada, in Baja California. This port city has sunny days year-round, cool nights, and views of the blue Pacific. Winters are mild and summers seldom blistering. In fact, it has the same superb climate as San Diego. And no wonder… Ensenada is only about an hour’s drive from the U.S. border.